As a UK road user you have a duty of care to ensure your motorbike is roadworthy. And the only formal way of declaring your motorbike as roadworthy is to pass the Ministry of Transport (MOT) test. Your motorbike does not require an MOT until it is three years old however once it is you will need to pass an MOT every year to keep your bike legally on the road. Riding without a valid MOT can result in a £1,000 fine and will definitely invalidate your insurance – an equally costly business if you’re involved in an accident and need to claim. What does the MOT certificate indicate? 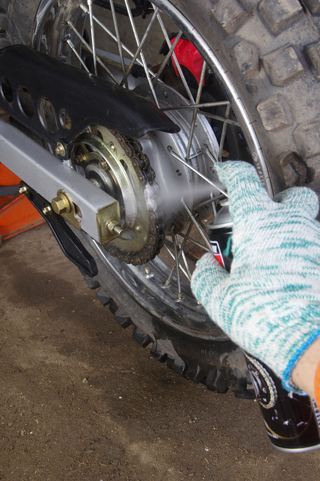 An MOT test certificate confirms that your motorbike was roadworthy at the time of the test. Essentially it means that your motorbike met the minimum requirements for a vehicle in terms of environmental and road safety standards set out by law. What doesn’t the MOT certificate indicate? The MOT certificate does not say that your motorbike is roadworthy from now until the end of time, nor does it state that your motorbike will remain roadworthy for the entirety of the certificate (one year). It relates solely to at the time of testing and, on collection of your vehicle, your MOT tester will usually indicate a couple of areas, items or aspects that they think will need some attention in the near future. An MOT does not test your motorbike’s engine, clutch or gearbox. How much does a motorbike MOT cost? Motorbike MOTs cost £29.65 however motorbikes with sidecars £37.80. What does the motorbike MOT test cover? The motorbike MOT test is designed to ensure that your bike is roadworthy and as a result it’s a thorough and extensive test that looks at all the vital aspects of your bike. 1. Seats – You need a seat to pass an MOT (shock). 2. Horn – Your horn needs to work and it must be the correct type. 3. Licence plates/frame and vehicle ID number – Your registration plates, vehicle ID and frame number all need to be legible and on your bike. 4. Lights – Your headlamp, rear lights, indicators and reflectors all need to work properly, be secure and in good condition. Your headlamp must also be the right colour and pointed in the right direction (forwards and down). 5. Tyres and wheels – Your tyres must be secure and in good condition, as should your wheels. Tyres should also be fitted properly, have the legal tread depth and good valve condition. 6. Wheel alignment – Your front and rear wheels must be aligned properly. 7. Footrests – Must be present and secure. 8. Clutch lever – Must not be damaged in any way or shortened. It must be easily operated. 9. Throttle – Must work properly. 10. Braking – The condition, operation and performance of your brakes will be tested, as well as the controls. 11. Steering and suspension – The condition, operation and performance of your steering and suspension will be tested thoroughly. This is one of the longest parts of the test. 12. Drive chain and sprocket – Your chain’s tension and condition will be assessed, with the chain guard checked for security. Your sprockets will be checked for wear. 13. Frame – The general condition of your frame will be checked, looking for cracks, damage and corrosion. 14. Exhaust system – Noise and security are checked. Sidecars – If your motorbike has a sidecar there will be an additional assessment of this with checks on the attachment, wheel alignment, suspension, lights and tyres, to name a few. Plenty of motorbikes fail their MOT however many of the faults that cause a fail are avoidable and down to general condition. The MOT fail rate for motorbikes stands at around 20 per cent and if you’re in that fifth you will be given a failure document which outlines where and why your bike failed. Your motorbike must be repaired to a standard where the MOT would be passed and it can only be ridden if you are driving to get repairs or for your next MOT test. You should not be charged for a retest if you return to the same testing facility before the end of the next working day. If you leave your motorbike at the testing facility to be repaired then you should not have to pay for your retest if it is carried out within 10 working days of its failure. You will have to pay for a retest if your motorbike fails for serious issues. You can check to see whether your motorbike’s faults should be charged for retesting here. Where can I get an MOT from? According to the Department for Transport (DfT), there are 2,800 motorbike MOT facilities in the UK. All accredited MOT test centres have testers who have passed a training course from the Vehicle and Operator Services Agency (VOSA). VOSA is a government agency who sets the standards of MOTs and regularly checks up on MOT testers to ensure they’re meeting the right standards, they can also discipline and prevent MOT test centres from carrying out the tests if they are below standard. VOSA also deals with complaints. I don’t agree with my MOT test result? You can disagree with an MOTs findings and if that’s the case you must complete a VT17 form (available from test stations) or call 0300 123 9000 within 14 days of the fail. However this service costs the price of a full MOT test. Help! I’ve lost my motorbike MOT certificate! If you lose your MOT certificate you can buy a duplicate one for £10. You will need the test number from your original MOT certificate or your unique number on your vehicle registration document (V5C), as well as your Vehicle Registration Mark. If you return to the same MOT test centre, your vehicle can be used as proof.